This dish boasts other bonuses too. It holds up well for several days in the fridge, and can be frozen as well. A recipe yields six servings, making it perfect for at least three meals when you are cooking for two, like I do! Best of all, this is a dish of big, assertive tastes that works beautifully as a main course. Serve it with a salad of baby spinach and romaine, tossed in lemon juice and olive oil, and add a warm, crusty ciabatta to complete the menu. Then, pat yourself on the shoulder for being such a clever cook! 1. With a sharp knife, cut the sausage links into 1/2- to 3/4-inch pieces. Heat 2 tablespoons of the oil in a large, deep-sided pot over medium heat. When hot, add enough sausage to fit comfortably in a single layer. Cook, stirring and turning, until browned well on all sides, 4 to 5 minutes. Drain on paper towels. Continue until all the sausage has been browned. 2. Discard all but one tablespoon of the drippings in the pot, and add the remaining olive oil. When the oil is hot, add the leeks and fennel. Cook stirring, until softened, 4 to 5 minutes. Add garlic and stir 1 minute more. 4. To serve, ladle soup into six soup bowls, and garnish each serving with some basil. Pass a bowl of Parmesan cheese for sprinkling. Serves 6. Note: Look for sweet Italian sausage links that are seasoned with fennel seeds. My local Whole Foods sells very flavorful sweet Italian links. When slicing the links, don’t remove the casings; just use a sharp knife to cut them into 1/2- to 3/4-inch pieces. If using loose sausage, simply shape it into small balls about 1/2- to 3/4- inch in diameter. Note: This soup often cooks down faster than anticipated so feel free to thin it with up to 1 1/2 cups additional chicken stock. This entry was posted in Food News and tagged fennel, Italian sausage, make ahead, soup, tomato by brosbottom. Bookmark the permalink. Hi Betty, both books are on my list of presents to give this Christmas. I’ve already given the soup and casserole books to my daughters. PS Would love to know when you’re in Maine again. Hi Jackie, I like your Christmas list with two Rosbottom books on it! Thank you. And, I’ll check with my web designer to see if there is a way he can add a print button! Another winner! Easy to make and delicious!!! So glad you liked it! 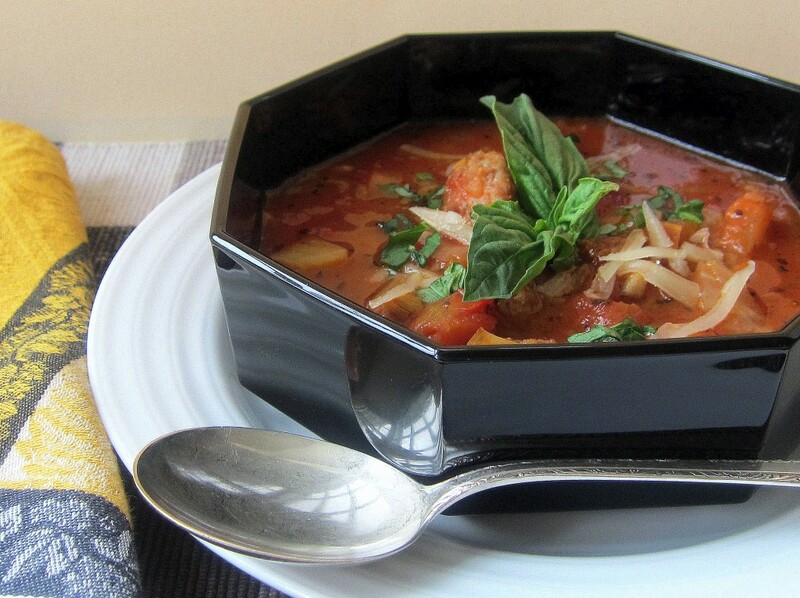 We had this soup several times the week I was testing it and never got tired of it! !